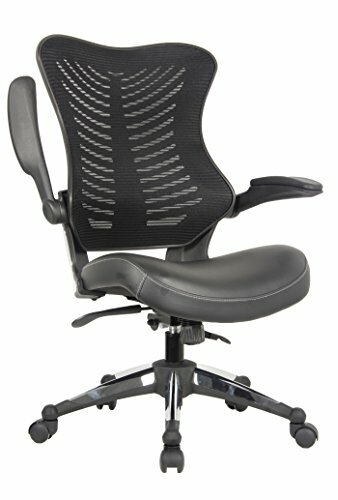 For this post, I have put together a collection of the best office chairs currently available. 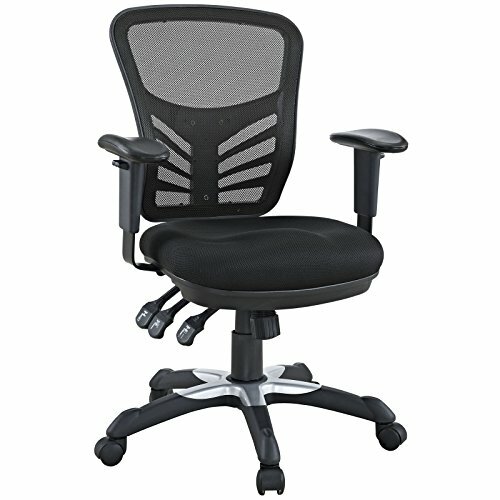 A quality office chair needs to be comfortable even after sitting for long periods of time. Comfort is achieved by utilizing a range of adjustments to make sure your office chair is the perfect fit. The following chairs use durable, long-lasting materials that will enable you to do your best work for years to come. 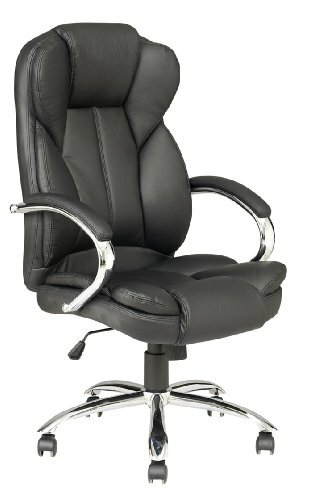 So here is my list of The 10 Best Office Chairs. 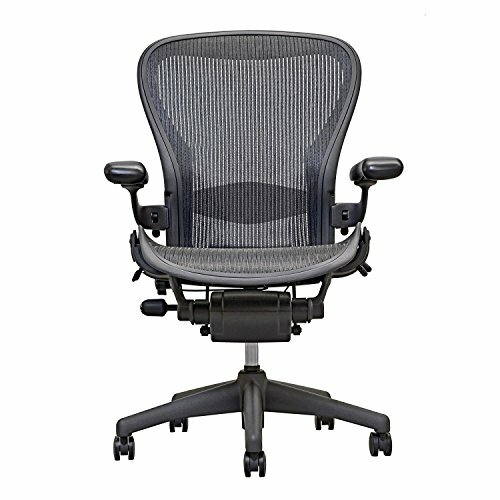 If you want the best office chair on the planet, then look no further than the Aeron chair. The upfront investment will pay off in the form of increased productivity and comfort. Having personally used an Aeron for years, it is in a league all its own. Best-selling office chair still defines expectations for ergonomic comfort more than 20 years after its debut. Breathable 8Z Pellicle suspension seat and back create eight zones of varying tension for optimal support. Aeron’s PostureFit SL technology affords the ideal sit — chest open, shoulders back, pelvis tilted slightly forward. Adjustable pads provide lumbar support and stabilize the base of the spine for the perfect balance of ergonomics and comfort. The high backrest shape of the chair ensures proper alignment and support of your spine as well as your neck. 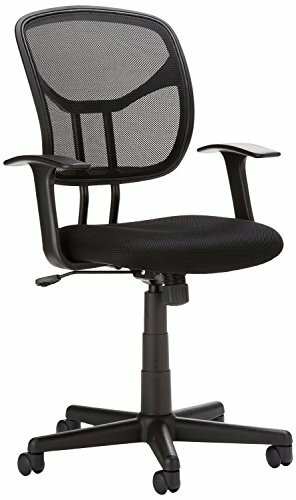 Seat adjustable height from 15.75" to 19.69"
Free replacement or money back guarantee for any quality problem within 30 days. The Boss B991 Heavy Duty Big & Tall Executive Chair provides not only sleek, professional style, but also sophisticated support for all-day comfort. The chair’s commercial-grade components support up to 350 pounds, while its extra-durable design stands up to heavy, everyday use. Features adjustable settings and curved contours to help keep your back supported and your body properly aligned—an important component when sitting for long periods of time. The chair’s built-in lumbar provides added support for the lower back, while its ergonomic tilt mechanism with infinite locking adjustment allows for setting the chair to the preferred angle. A 6" adjustable height range designed and supported with a heavy duty pneumatic gas lift to raise and lower the seat. The chair’s upholstery consists of smooth, supple bonded leather, Boss LeatherPlus, which covers both the contoured-for-support back cushion and the padded seat cushion. The seat cushion’s deep layers of double plush padding help ensure superior and consistent sitting comfort throughout the day. Available in Classic Black, Bomber Brown, and now Gray. 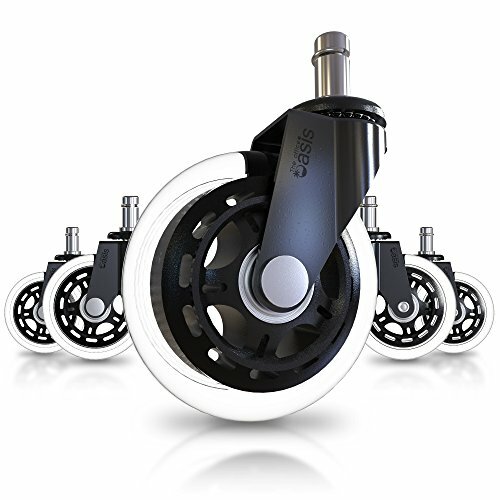 For all office chairs I recommend you upgrade the generic casters. These high-quality, rollerblade-style wheels offer a quieter, smoother rolling experience while preventing flooring damage. 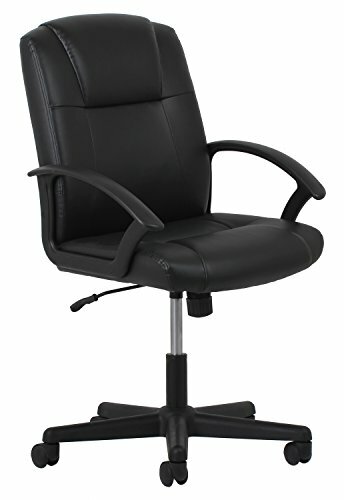 Give your office an elegant touch with this modern and contemporary executive task office chair. Bigger base for greater stability. Double casters and upgraded gas lift. Lock back in any position. Featuring reliable ergonomic support, articulate comes with a breathable mesh back, passive lumbar support, and generously padded and contoured 6” thick mesh seat cushion. Designed with productivity in mind, articulate is perfect for everyday use. Easily adjusts to your needs with height adjustable armrests. Comfortable, soft PU leather upholstery. Ample padding, oil and water resistance. Adjustable height from 19" to 23". 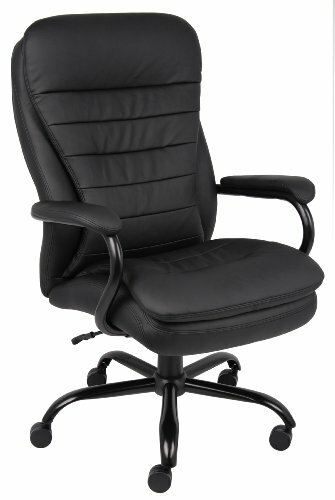 Ergonomic PU leather executive office chair with perfect lumbar support and extra thick padding for the ultimate comfort. Tilt tension knob underneath the seat to adjust the flexibility of rocking back in your chair. Waterfall seat edge for reduced pressure on the back of the legs and intended to increase leg circulation and reduce fatigue. 1-year warranty and 100% satisfaction guarantee. The smooth, pliable softhread leather seating surface with tailored stitching detail gives an upscale, luxurious feel at a competitive price. 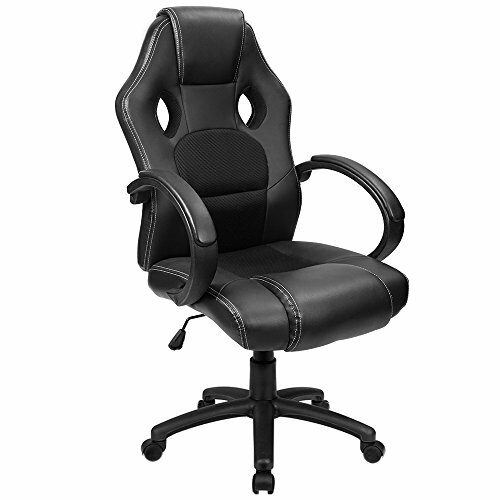 Fully adjustable seat height and seat back recline matches your comfort and work preferences. All-day upper body support with an integrated headrest and fixed arms. This heavy duty chair has a 250 pound weight capacity for long-lasting use. Warranty & support: backed by the Essentials By OFM Limited Warranty. This mid-back mesh office chair with its modern profile and sophisticated appearance offers a professional look for any location. Smooth contours and adjustable settings allow for all-day comfort. Simple pneumatic controls let you raise or lower your seat and rock back in your chair--or remain firmly sitting up straight. Black mesh covers both the padded seat of the chair, as well as the back of the chair. In addition to lower-back support and border detailing, the gently curved back of the chair provides mesh-only sections for enhanced breathability. Black, nylon, T-shaped armrests offer added support and comfort. 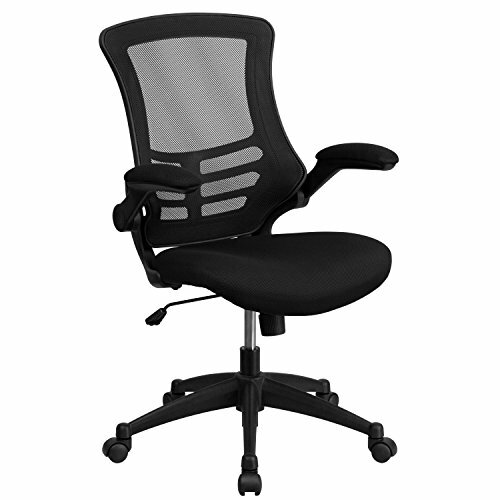 Mid-back adjustable design with built-in lumbar support. Curved mesh back that gives additional support to the lumbar area. The mid-back design offers support to the mid-to-upper back region. Tilt lock mechanism with tilt tension knob and pneumatic seat height adjustment. Padded black mesh upholstered swivel seat with waterfall design. The mesh upholstered seat features a waterfall front edge that removes pressure from the lower legs and improves circulation. I hope this list has been helpful, if I left out an office chair you think is important, let me know in the comments below.